Blastech Drums With 20" Bass Drum. 8-ply VSS Keller Maple Shell 12"X6" Matching Snare and 20"X12" Bass Drum 8-ply VSS Keller Maple Shell with 10-ply lacquered wood hoops. Includes Set of Five "Blaster" Drum Triggers and Cables. All drums can be mounted on a heavy duty Chrome Steel Rack, for an additional charge. 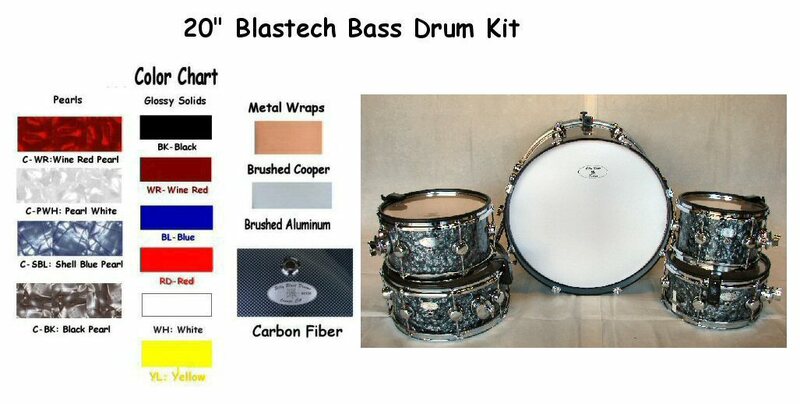 All Blastech’s come with my New Sound Controlled Drum Head and a resonant head on the Bottom.